Winter can be harsh for so many folks with the cold and dull gray skies. In the dead of winter, I like to set my sights on Spring. 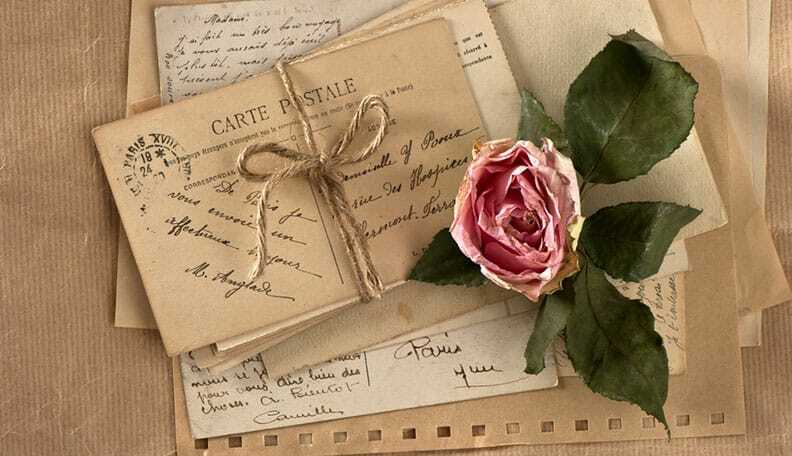 Spring for me is hope, warmth, start of new growth. 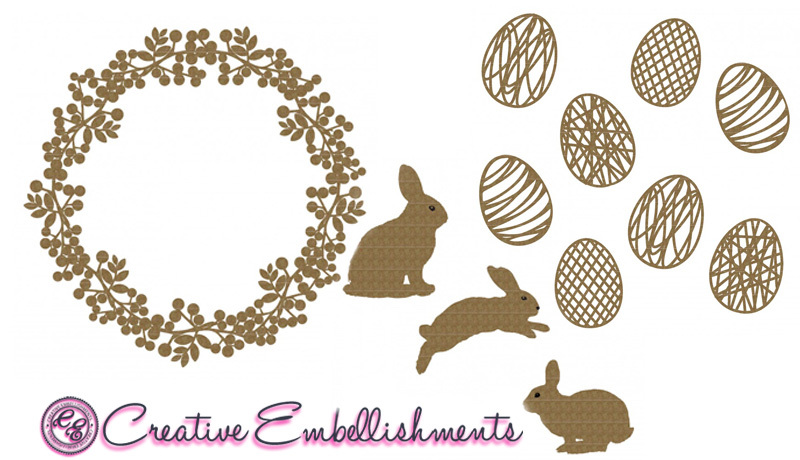 I am setting my sights on Spring by bringing a touch of Spring/Easter to my home with a sweet Spring 8in x8in canvas adorned with delightful chipboard pieces from Creative Embellishments. 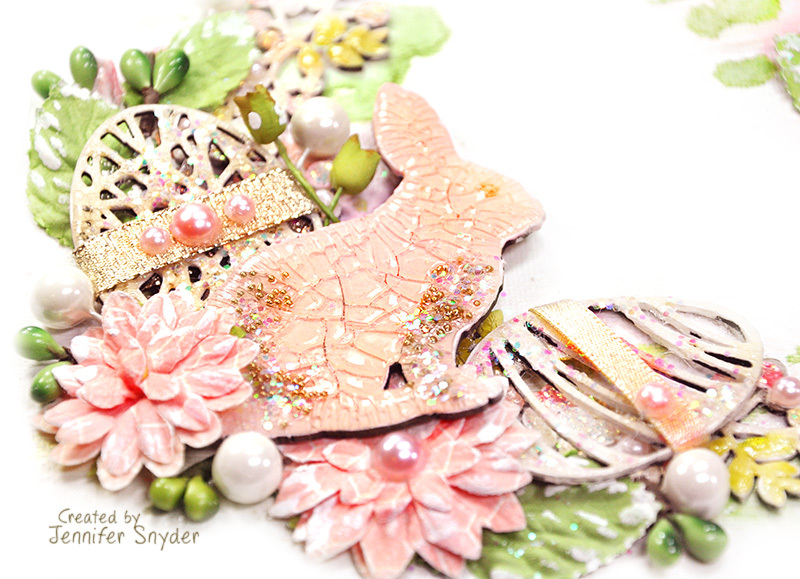 The bunny is darling - perfect for quick Easter cards and projects...or even baby cards. 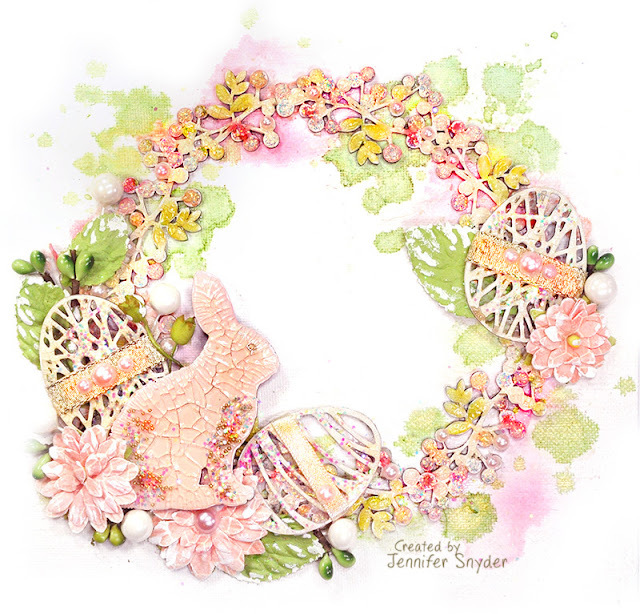 I simply painted mine with soft pink acrylic paint and coated with a crackle medium like Crackle Accents by Ranger. I also tossed in some gold micro beads (glitter works well also). 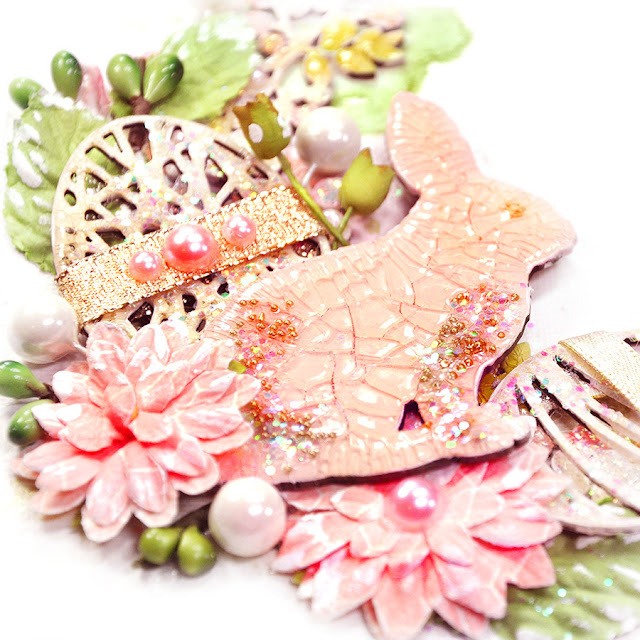 Next, I gussied up the Creative Embellishments -Fun Eggs by painting them with a creamy ivory acrylic, adding a simple piece of gold ribbon and topping with pink pearls. Elegant and yet so very simple. 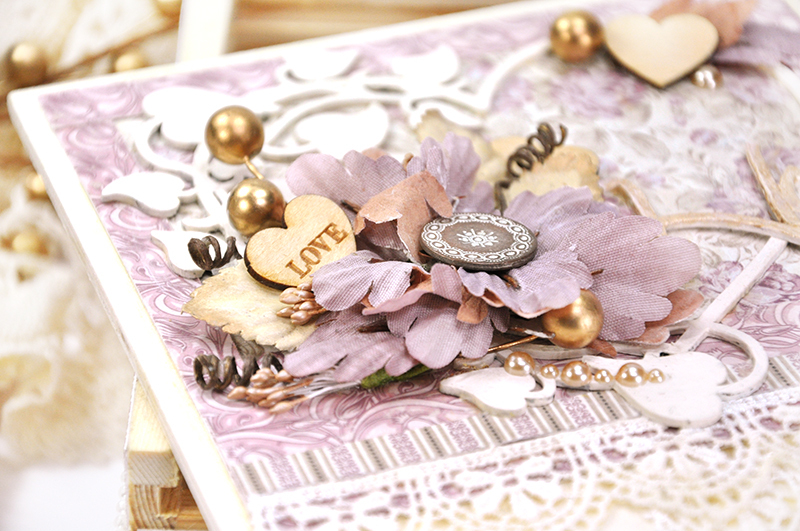 Just a bit about the 6 inch wreath/frame -Creative Embellishments Chipboard- Berry Frame 3. I painted the berries with a variety of acrylic paints - ivory cream, pink and green. Then I dabbed the berries with Stickles Glitter Glue to add some glitz and make the berries pop. I'll tell ya, the Stickles really doesn't show well in photos but it has such a bedazzling look in person. I started with a plain 8in x8in canvas as my base. I used some mists and watercolors to create the background of the canvas by adding one color at a time with a paint brush and a bit of extra water and heat drying it between colors. First the green, then the pink so that they don't run together and create olive drab mud. The heating or at least drying process is important. Shop for your Creative Embellishments chippies right here. I'm here today with a Valentine's layout filled with lots of love, pretty bows and banners to celebrate the big day. 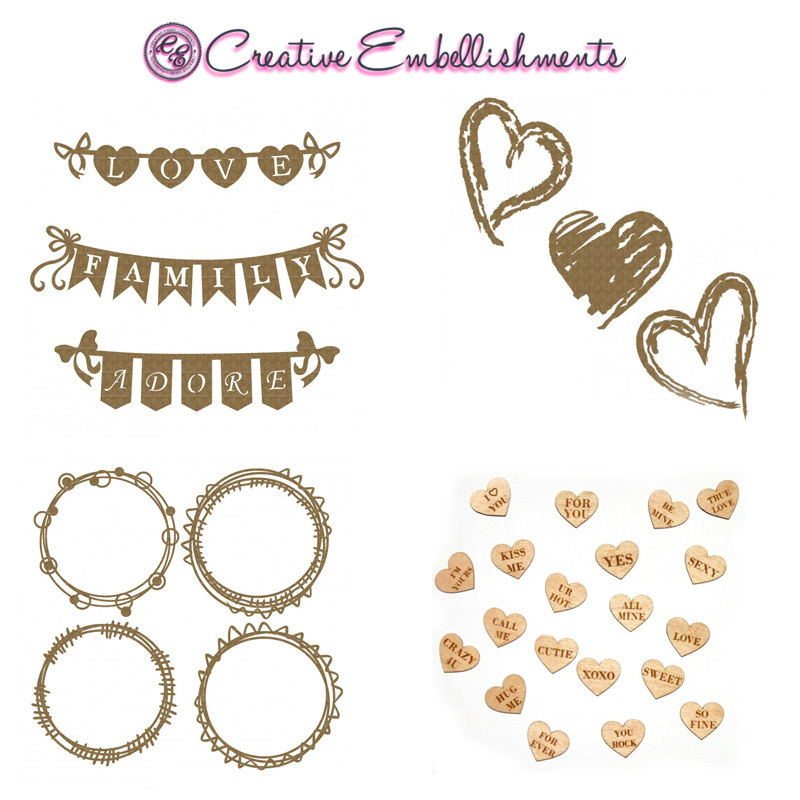 Of course these wonderful embellishments start with Creative Embellishments chipboard pieces. This collection was created to celebrate the 10th Anniversary of Maja Design. Gorgeous collection with a versatile range of colors. 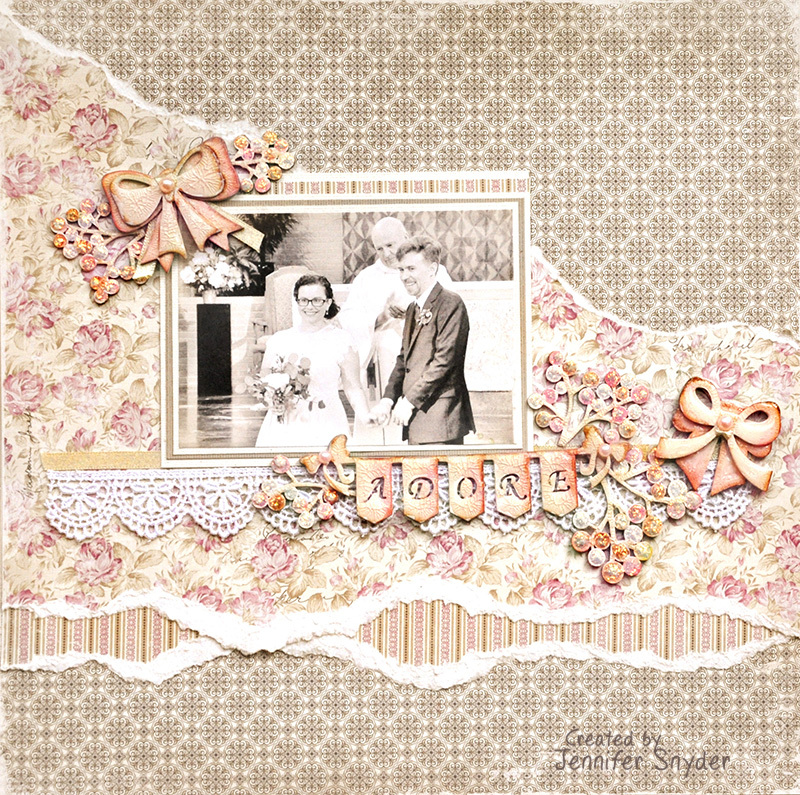 I love to make chipboard look soft and wispy. My technique is quite easy. 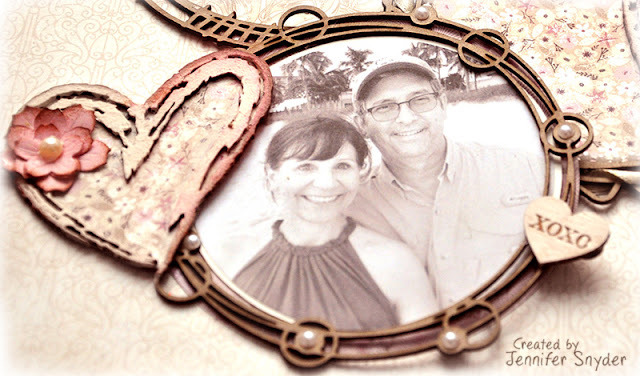 Paint everything with cheap creamy white paint - like a french vanilla color. I do not bother with gesso. It's too white for my needs and doesn't have enough coverage. I go straight for the cheap acrylic paint. Once the paint has dried completely, I went back in and added some pink/red ink for accents using a paint brush ( or waterbrush) for softness. 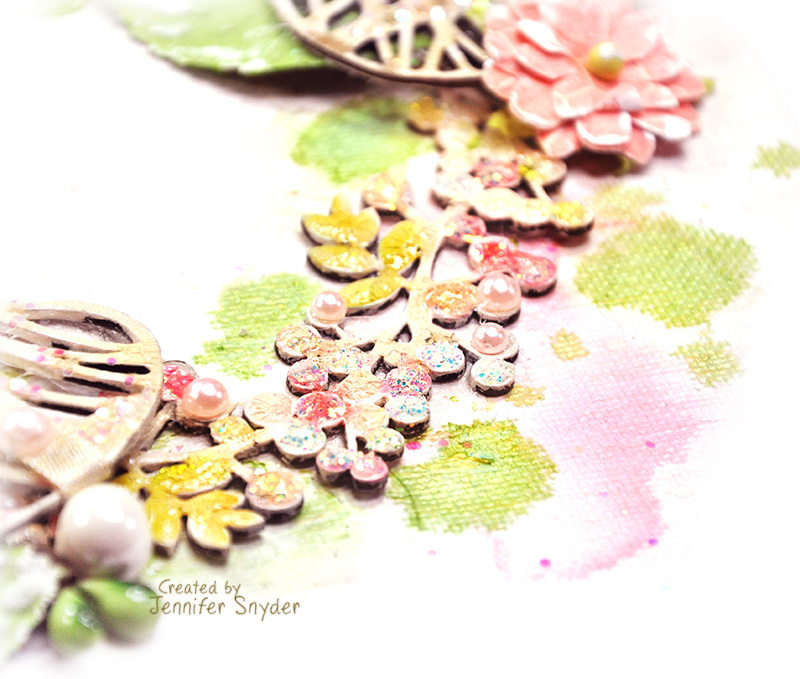 The water brush eliminates any harsh lines on the chipboard. Last step is to add some brown ink here and there as light shading. 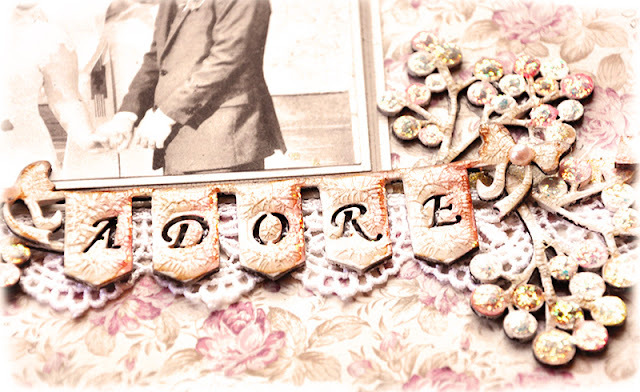 Additional finishing details may be Crackle Accents by Ranger, pearls or Stickles Glitter Glue for pops of glitz. I'll tell ya, the Stickles really doesn't show well in photos but it has such a bedazzling look in person. Not sure how to type this without sounding odd, but I adore the "Adore Banner" using the Family Banners chipboard. 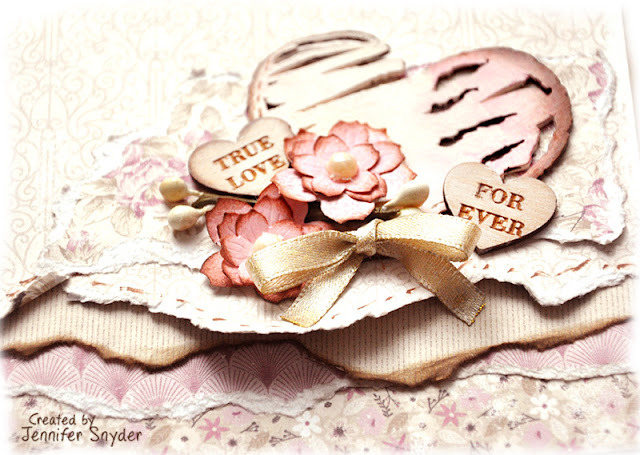 Such a sweet and romantic touch. That was topped with the crackle accents as well. Today I am sharing an altered box I made using Maja Design's new collection, Celebrations. 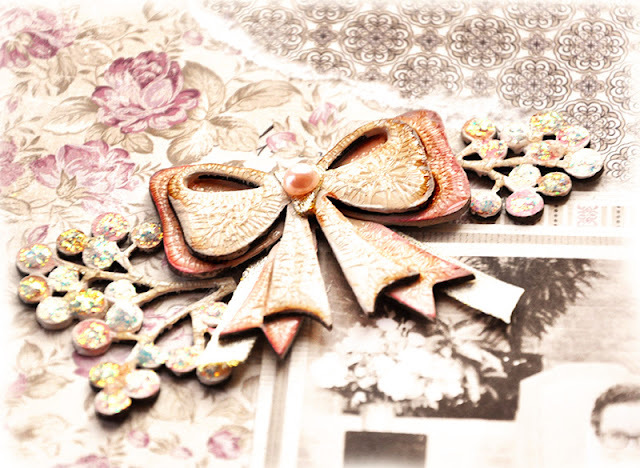 This collection is super special because it celebrates Maja Design's 10th anniversary. 10 years! 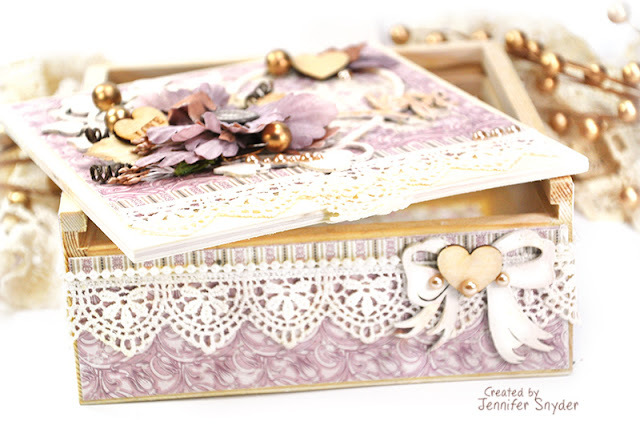 My box project was created for the Feb. Mood Board, as seen above. 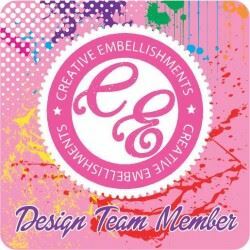 The challenge is open to interpretation - which your choice of colors, words, images as inspiration. Come Join the Mood Board Challenge at Maja Design. I am also using some gorgeous chipboard and wood veneer embellishments from Creative Embellishments. These are the papers I used to decorate the box. This new collection is absolutely stunning in person. 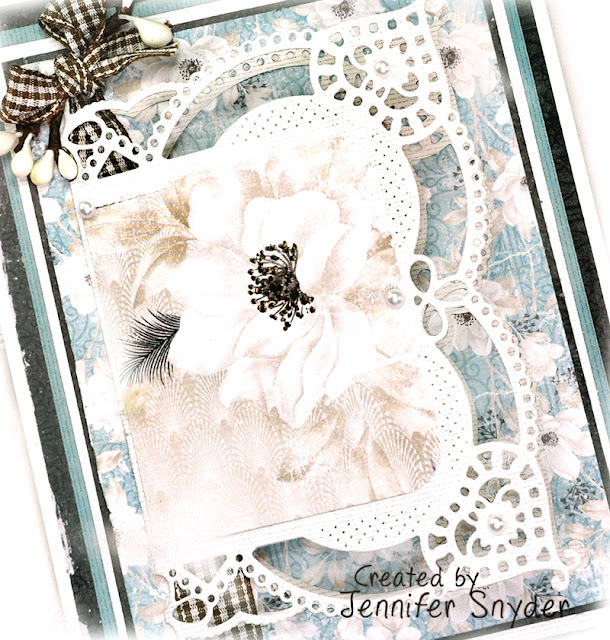 It's also versatile providing a great selection of blues and masculine colors/patterns for stronger masculine cards and projects. A little about the box. It's a cheap pine treat/trinket box bought in the clearance section after Christmas. The paper is perfect because it covers the Christmas Greeting on the top. I covered the sides, top and even the inside of the box with this collection. I'd like to just gush a bit about the Creative Embellishments Wood Veneer Conversation Hearts. These are the cutest conversation hearts I've ever seen. They each have a word on the front, like your typical candy conversation heart - but the backside is blank giving the wood heart amazing versatility. I've presented the hearts both ways on my project. Next a bit about the Dream Word Set. 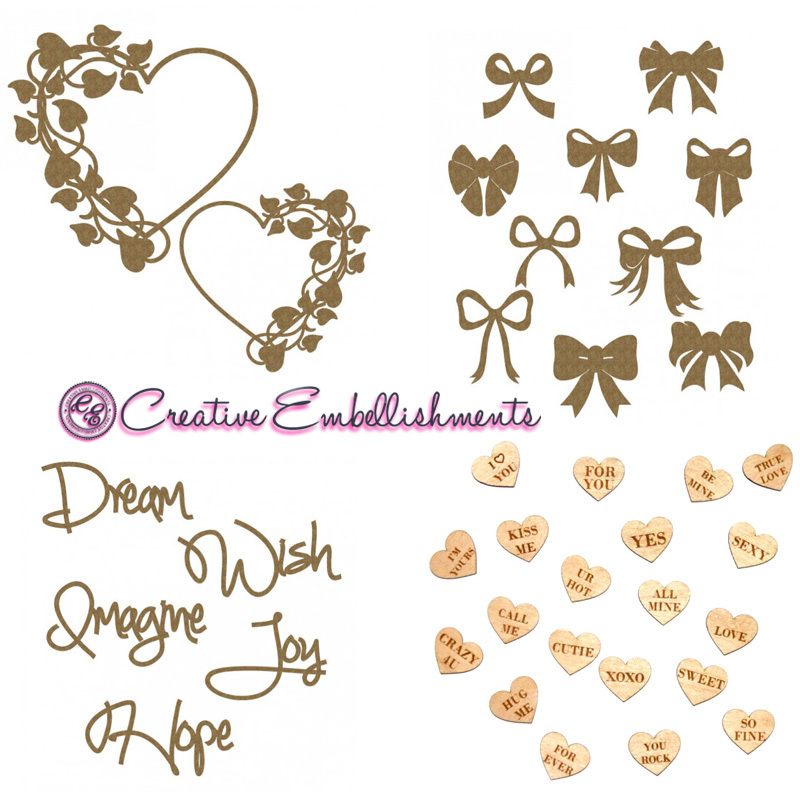 This chipboard set comes with five words: Hope, Dream, Wish, Imagine, Joy. 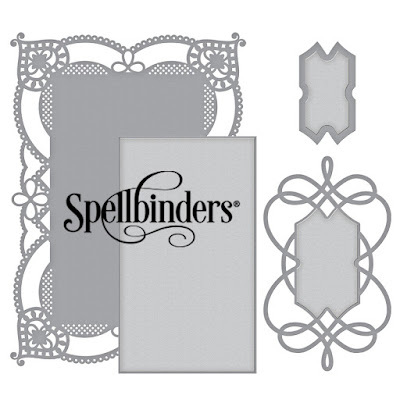 That means you can potentially create five cards/projects with these. What an amazing value -( Hope, Dream, Wish, Imagine, Joy). 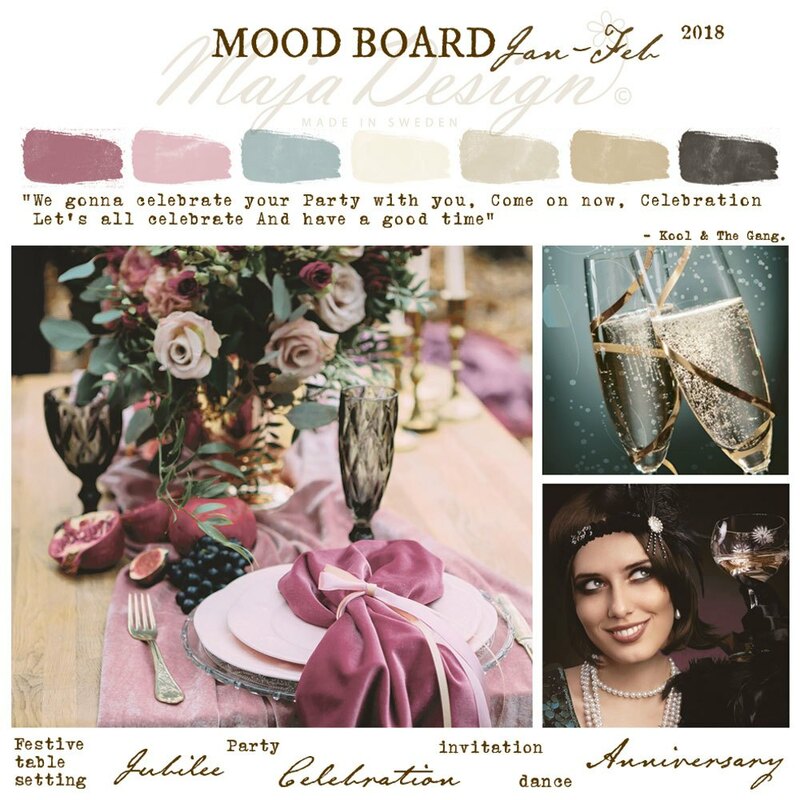 You can shop for the Maja Design Celebration collection here. Shop for Creative Embellishments products here. 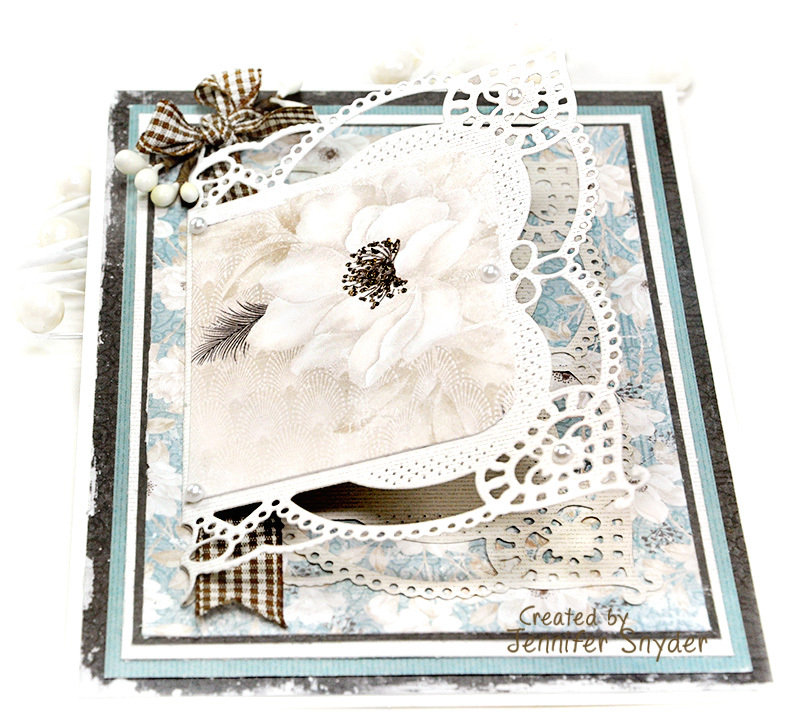 I'm learning cards do not need to be overly embellished to make them graceful and beautiful. While I do love my flowers and dimensional creations, classic elegance is always en vogue. 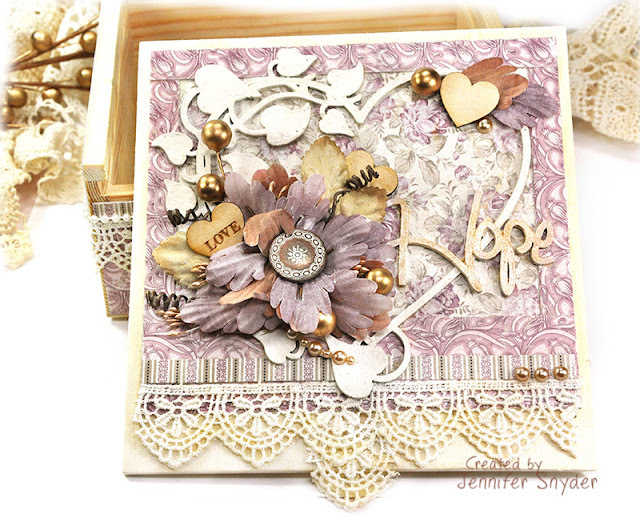 I'm letting Maja Design paper and a Spellbinders die do all the work on this card. I'm gonna sit back and watch the magic happen. The die above is Spellbinders - Coralene's Chemise Layering Frame Dies- Chantilly Paper Lace Collection by Becca Feeken . My Paper choice is from Maja Design called Celebration with it's companion monochrome collection, Shades of Celebration. This collection was designed to recognize 10 years in business. 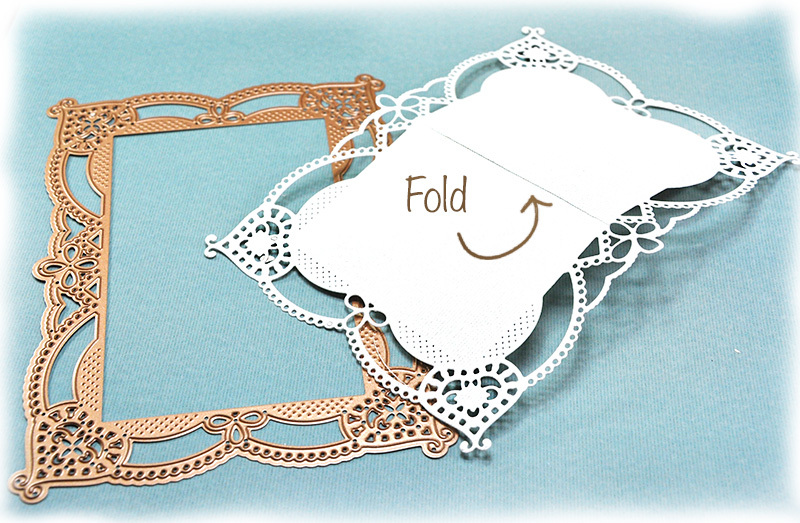 The sentiment part of my card is actually the folded die. I'm using that as my "mini card". Doesn't get much easier. 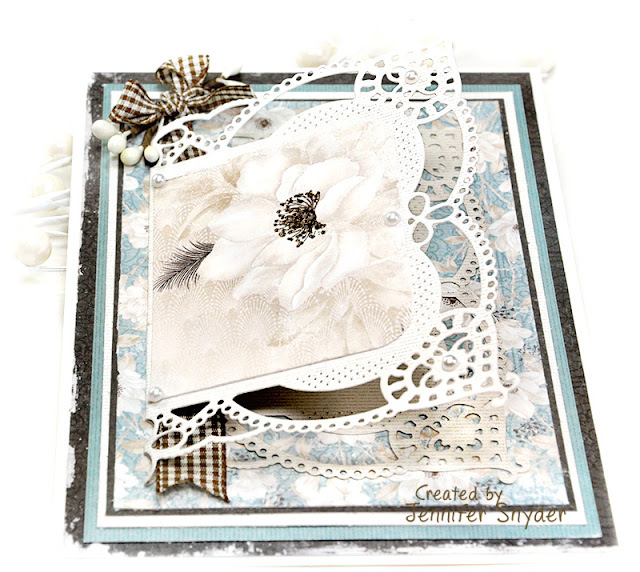 The Spellbinders Chantilly Paper Lace Collection is one of the many from the Amazing Paper Grace Collections designed by Becca Feeken. 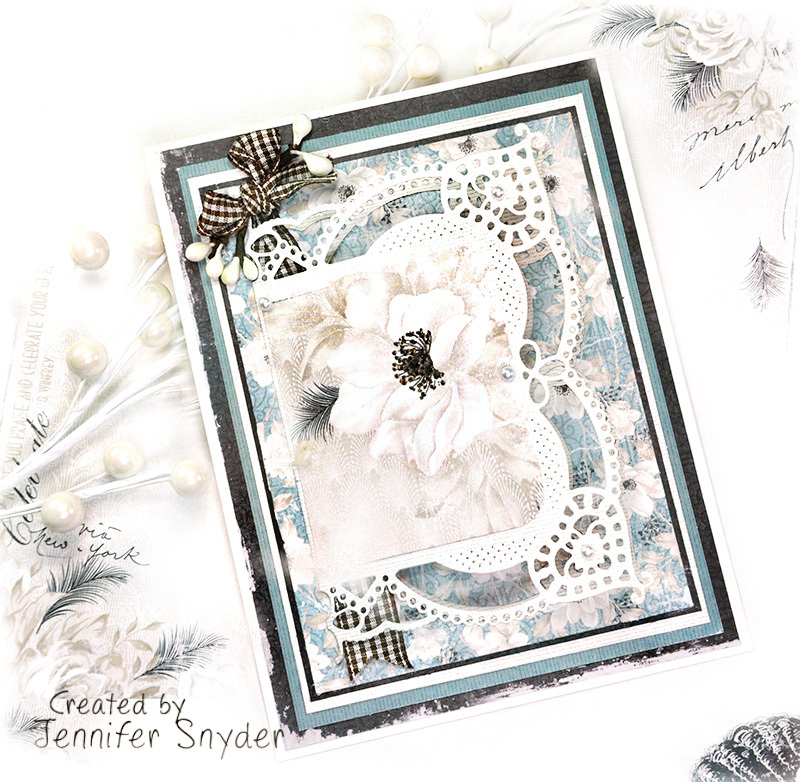 And one last look at the card. Thanks for stopping by to look. 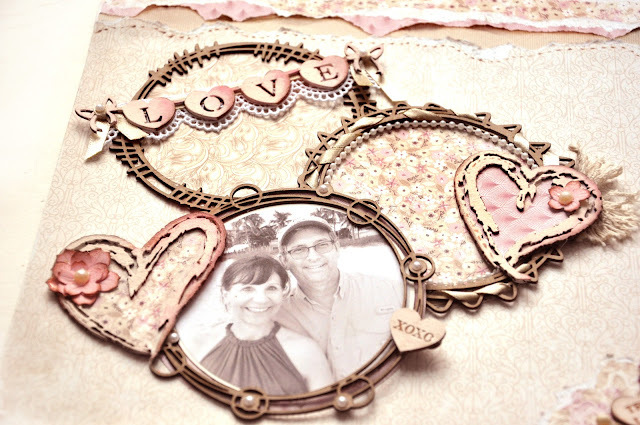 I have a layout to celebrate Valentine's Day and the month of love. This was created for the February Challenge at Creative Embellishments. I hope you join us! 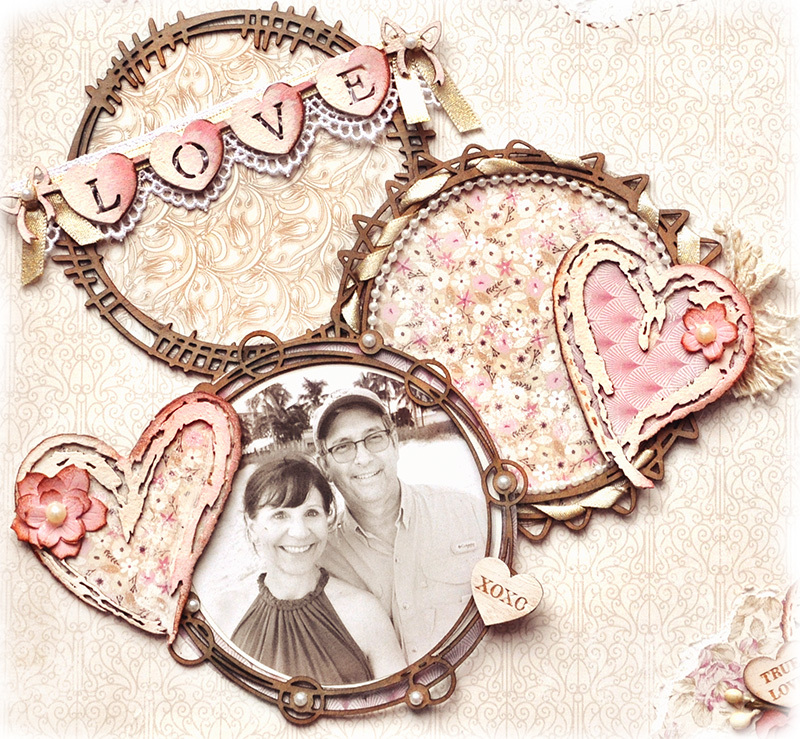 A little Valentine's Day love using the brand new collection from Maja Design called Celebrations. This stunning new collection was created to celebrate the 10 year anniversary of Maja Design. Tis the season for love and soft touches. I have added a variety of fabulous chipboard ( and wood veneer) pieces to this layout- some painted a based coat of soft cream paint while the Doodle Circle Frames have been left natural. 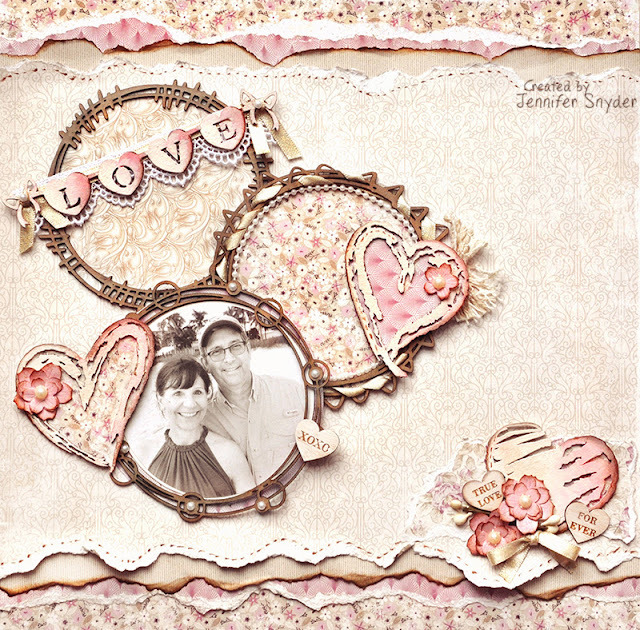 This layout has the following Creative Embellishments pieces: Circle Doodle Frames, Family Banners, Distressed Hearts and Wood Veneer -Conversation Hearts. 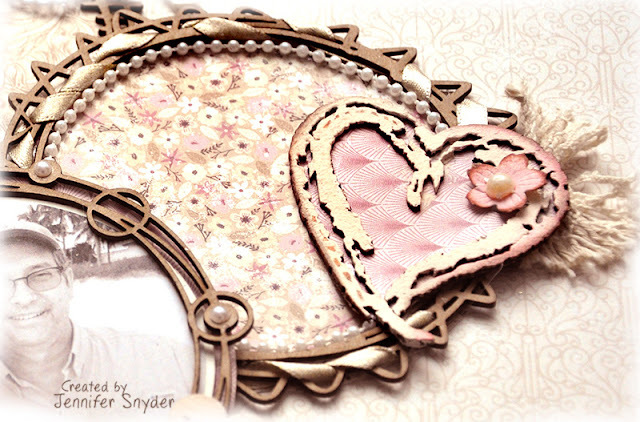 As I had mentioned above, my page was crafted for the February Challenge at Creative Embellishments. Based off the image below. Use your imagination and interpret as you wish. The great thing about chipboard is that it comes out of the package ready to be used - no treatments necessary. 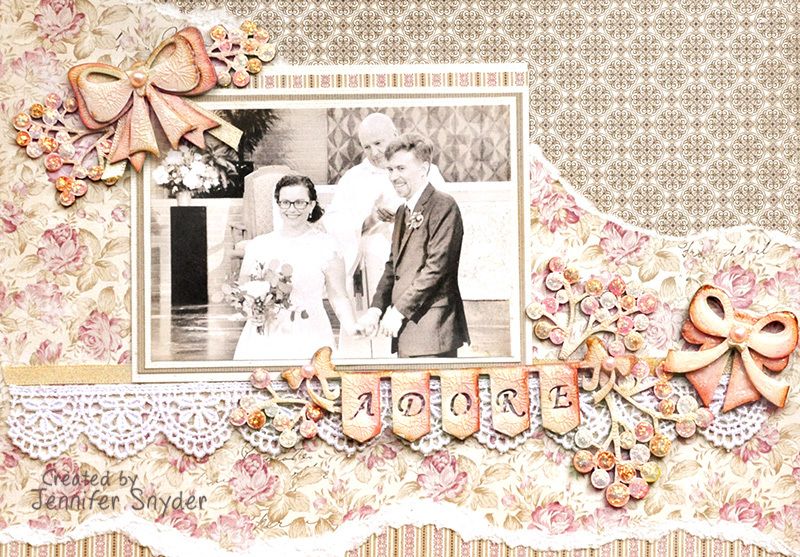 I left the Circle Doodle Frames untreated however I added a few easy embellishments like pearls and ribbon. 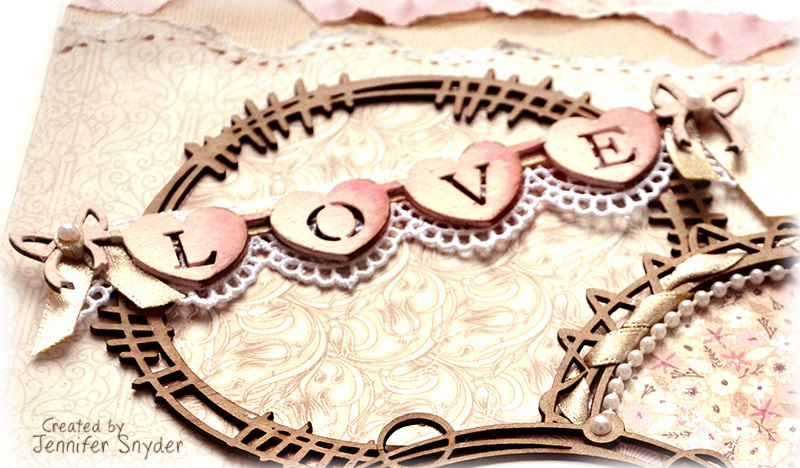 The adoable Wood Veneer -Conversation Hearts were just washed lightly with a mixture of ivory paint and water. I love these delicious little hearts. 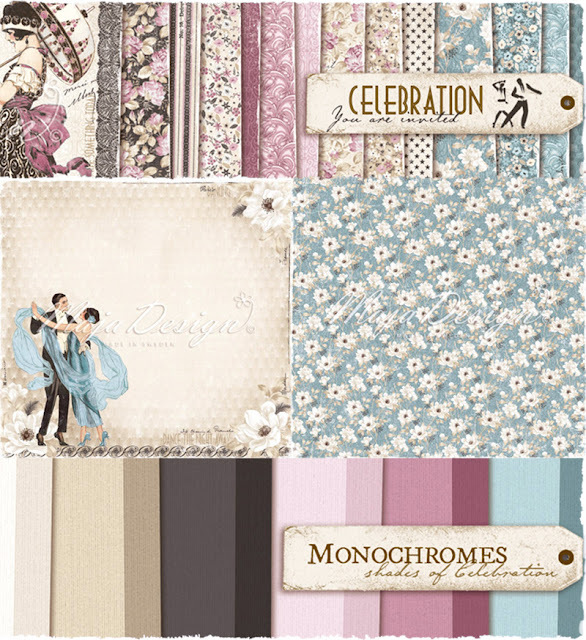 This shows the gorgeous layers of paper from Maja Design -Celebration collection. Brand new and completely spectacular - one for your "must have list". 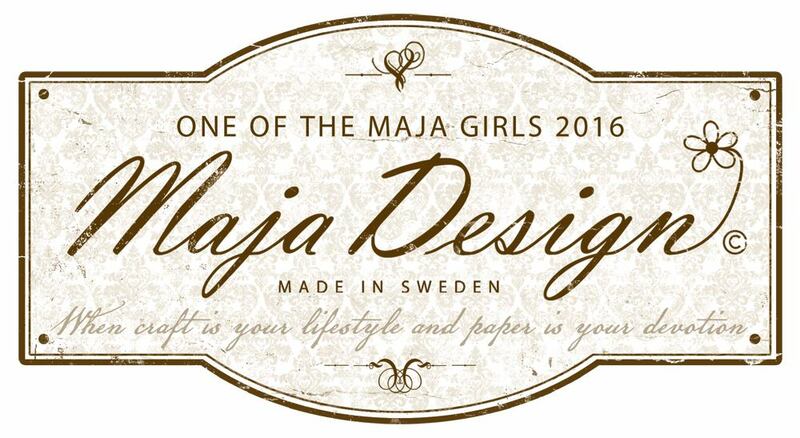 You can shop for all the Maja Design papers right here. 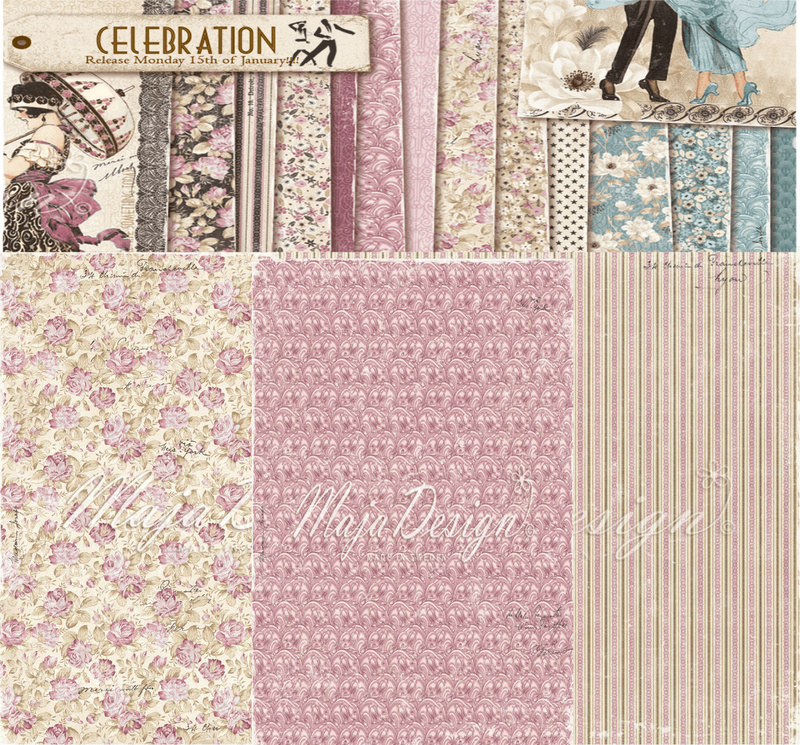 You can shop for the new Celebrations collection right here. 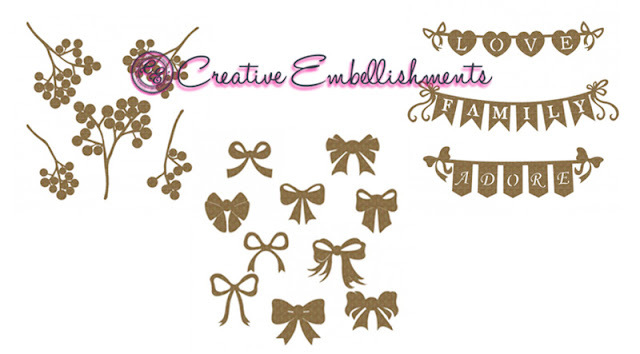 Shop for Creative Embellishments products right here. 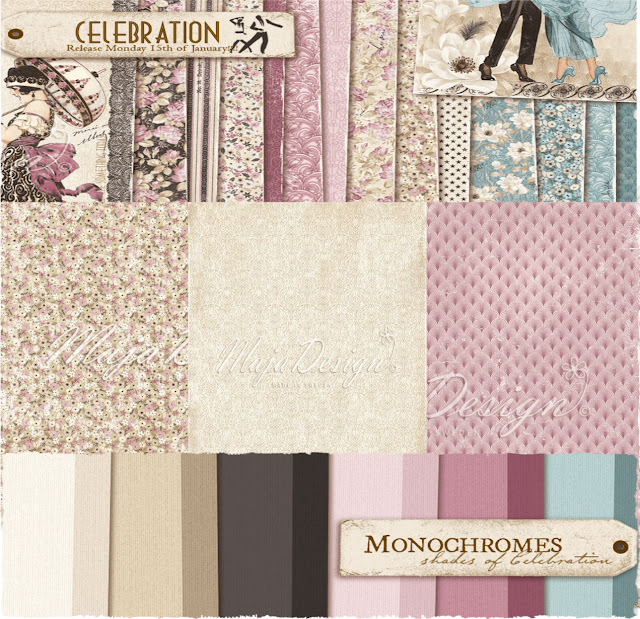 Maja Design Celebrations - Monochrome Collection "Shades of Celebration"